Welcome, today I will be talking about camps. Like how they build character, confidence and charisma in ones self. I recently went to a camp. It was from Monday to Wednesday (28th to 30th September 2009). Now, i can start babbling about what I did, like what happened or whatever was going on in that camp. But I wont, firstly because, its interesting, secondly because its only for the people I know and care and thirdly because I know you don’t care. So onto the main subject, what am I talking about? simple.. Whenever someone goes to camp, what is the first thing they think of? ‘Going somewhere with their mates without parental supervision’ Well, this may not be the case for everyone, because everyone is different, but this is the typical response. However, there is more to it.. When you go onto a camp, you interact, you communicate and most of all, socialize. You are with your peers from morning to night, and everyone shares their routines with each other. You help each other during activities, This results in teamwork and a strong friendship. When eating at lunch, you talk and this is another way in which friendships are grown and or strengthened. I guess I’ve left this short. But i only wanted to say that camps are important…very important. So when your next school camp comes, please dont reject it, its an experience that you will only get a few times in you life. “We are all born for love. It is the principal of existence and its only end.”, said Disraeli. No one, even greatest psychologists, can define the word “love” successfully. However, true love is an accord, long process of understanding, sharing unforgetable memories. In its essence, love is appreciation, a recognition of another’s value. Without respect, love cannot go far. It’s not a moment of whimsy, nor is it used to label the sexual excitement of the young. Our heart is sometimes shaken up by a graceful look, beautiful eyes, or dimples of a nice girl but it is just stirred for a moment, not everlasting. To love is not to possess. Up to now, so to speak, the life of human being is not simply limited to the most pressing needs, food to keep them alive and clothes to keep them warm. Besides the material requirement, spiritual needs are, of course, not less important in which love is always an immortal theme. With the time, love which is a wonderful feeling comes to everyone at sometime in his life. As being in love, you will feel happier to look towards a brighter future and you also want to share joys as well as sorrows. In love, sacrifice is considered as an indispensable virtue that is a clearly moral standard asserted by one’s love. Furthermore, sacrificing all of the most precious things of your life for your lover is an important factor to keep your love everlasting. Along with love and its sacred mission, jealousy is always a company going along with love at any time and anywhere. Frankly speaking, jealousy which is put in the right place and right time will be an efficient medicine in order to make love more colorful. On the contrary, an absurb jealousy, in order to satisfy the ego and selfishness, can break down many genuine hearts of lovers. There can be no doubt that the absurd jealousy certainly is a culprit that kills many romantic dream love stories. How pitiful the jealousy is blamed like this! From my point of view, jealousy itself has no guilt at all; the most important is wether people use it properly or not. To sum up, more than anything else on this world, love and jealousy are 2 necessary qualities to keep human’s race existing with the time. I guess I’ve just summed it up. Yes, what i am trying to say is that, the controlled breeding of a dog, purely for improving its “deformation” is utterly and despicably inhumane! If you don’t understand what I’m talking about, the let me show you some examples. As you can see, there are some obvious differences in the two pictures. 1. The nose of the bulldog has been severely deformed. 2. 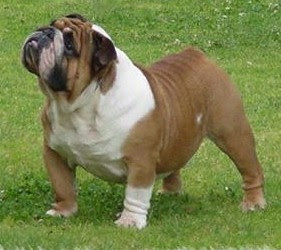 The size of the bulldog (although not shown in the pictures) has greatly diminished compared to its older relative. 3. There is a noticeably less amount of flabby skin on its face and back. Over the many years of controlled breeding, we have created numerous abnormalities in almost every of our dog species. So from these features of the bulldog, let me…enlighten you on the disadvantages and advantages. – The deformation of the face is due to the shrinking of the dog’s skull, the nose of the dog’s skull has shrunk due to the years of controlled breeding. This causes an irregular shape in the dog’s nose which in turn creates many respiratory infections, diseases, problems and physical limitations. Every bulldog that is born, develops respiratory diseases and problems! – The diminished size of the bulldog compared to its older relative is very, very bad. why? well, its short legs means that it has to take more steps to walk an amount of distance. e.g. if i take one step, the bulldog must take four. This including the dog’s respiratory limitations equals an unhealthy and problematic dog that would cost its owner many tens of thousands of dollars to correct. – The more deformed the dog, the better you will rank in a dog show. Now, I don’t need to tell you, for you to understand how badly we are treating dogs (or any other species might i note). So…why would we be doing this? Is it because we did not know that it was bad? Is it because we like deforming dogs, merely for entertainment? OR, Is it because of a trophy and $10,000 reward money? I know it is the 3rd answer. Breeders, from since the early 1800s, have intended on deforming their dog, to have the more “extreme” feature compared to any other dog of its species. They did this because of the dog shows and where might i say, did these dog shows originate from? England of course…. In my opinion, our lust for better complexion in one’s face, our desire to increase one’s feature even to the point of being a “freak” and our obvious expectation to create predicaments points to none other than, our greed. Now, i don’t mean all of us do this, but there are those who always ruin this for others. I myself have a dog, and this is the reason why i am so..passionate to such a topic. My dog is a Labrador a guess what? It has already been deformed. But this deformation occurred in the 1800s and as generations have passed, every Labrador has inherited this problem. You may be wondering, What is the deformation? every, Labrador i know is normal as far as i can see. Well, let me tell you this, its deformation does not lie on any visual features, this deformation is actually down to its bone. So, in fact, every Labrador will encounter arthritis sometime in its life. Other dogs with deformations include, Chihuahuas (it used to be a much bigger dog with a bigger jaw), “Wiener dogs” (it used to be taller and its body was obviously shorter), beagles were taller, almost as tall as a Labrador. So in conclusion, i say that breeders who breed dogs purely for the entertainment of others and the reward for a trophy is what i label as evil and inhumane. We do not own any of the pictures, videos or any media related material other than the text on the website. We look forward to any feedback. STORM! RUN! HIDE! – and gone. Hahaha. Three days ago the (23rd of September, 2009) there was a phenomenal natural “event” that occurred in New South Wales of Australia. I labeled this occurrence as an event because it did not show any disastrous effects, excluding the large expenses for electrical companies such as energy Australia. On that Wednesday, were winds blowing from up to 80km/h in the rural areas of western New South Wales, these winds had apparently picked up the reddish/orange dust of the outback and blown them all across the states of New South Wales. These winds blew all the way from the city of Broken Hill to Sydney. You may be wondering, “how could these winds have blown so much red dust from such a large distance”? (points and measures the distance from Broken Hill to Sydney on the globe). Well, the answer is: “These winds did not blow, they literally fanned the dust for hours on end without ceasing”. I should also note, prior to the dust storm, was a HUGE amount of thunder, rain and wind. Seriously! The thunder was MAJOR, i was listening to Human by The Killers, and the thunder made my bass jump and my speakers go static. This happened because i literally saw a flash of lighting hit a house right in front of my street, the sound of the lightning and the flash happened at the exact same time. So here is how i saw this whole event. i’ll list it as a time line for you folks. 06.00pm: i wake up to hear a huge rainstorm. my roof was ringing with “thuds” and “cracks” from the fat rain drops. 08.00pm: i turn on my music, and then watch the amount of water flowing down the street whilst feeling amused at a guy struggling to accelerate his car upwards from my steep hill. 08.15pm: the guy is still struggling. thunder strikes in from of me, electronic system goes berserk. 01.00am: wind suddenly picks up and the house is filled with rattles, i look outside and see huge gusts of wind that even shape the palm trees to the form of a banana, the whole place turns dark outside. 04.00am: street is orange, the dust storm has stopped. -coincidentally, the price for car washes had been increased. Here is a news article that talks of what happened after the Dust Storm.